Electric carsAlthough more and more admired, but not at any time charge is a major drawback . South Korean researchers then developed a new charge system for electric vehicles on the road while driving , while charge . This new generation of charging system developed by the Korea Advanced Institute of Technology . It is hundreds of meters long in the width of the road lay between 20 cm to 90 cm power strip, and then install the magnetic device under the car . When the car when traveling on the road , do not touch the power board magnetic devices can receive power from the power supply board , so that the car battery. The inductive charging principle has been used in some electric toothbrush . Some electric toothbrushes, which were sealed for water treatment , charging on the base as long as the toothbrush , you can charge through induction . This system and systems like trams , cars do not have magnetic devices and power supply board direct contact with the pedestrian to the power supply board and will not touch an electric shock . Responsible for the project manager Zhao Gao said: "If we can 10% of the city road paved this power strip , we could supply electricity to electric vehicles . " Korea Advanced Institute of Technology campus of the road lay a number of power supply board , use of electric golf cart to experiment . Researchers are are designed to drive electric cars and buses charging system . Cho Dong- ho said that when the system used on the road , the power supply board can be installed in bus lanes and close to the crossForkIntersection of the road , the car can be charged with slowing down the speed . Seoul city's public buses and some will try it this year . The cost of installing the new system is about 400 million won per km (about 468,000 dollars) , not including electricity . Using solar roads for power generation is an idea that is being tested by the U.S. DOE. Over in Korea, tests involving a road giving up some power are underway. Instead of sucking up sunlight, the prototype roads send energy upwards to small electric vehicles through touchless magnetic induction technology. 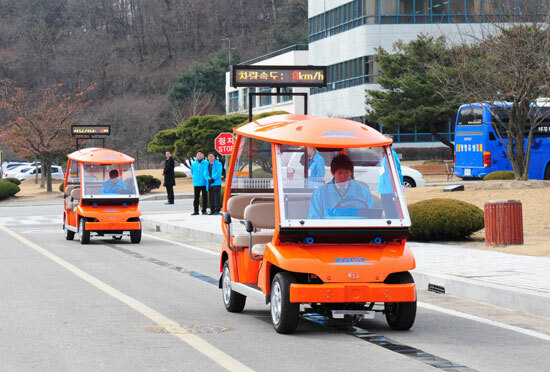 Developed by the Korea Advanced Institute of Technology (KAIST), the OLEV (On Line Electric Vehicle) system uses buried power cables in the road and a receiving unit in the EVs traveling on it. KAIST says that power is transferred at 80 percent efficiency when going through a centimeter of air (not exactly practical for today's cars) and is 60 percent efficient through 12 centimeters. KAIST is working to make the OLEV a suitable business prospect. As tipster Yanquetino writes, "I opine that we will still need batteries in our EVs, but... laying such cables down a specialized lane of our Interstates would eliminate range anxiety once and for all. Rather than installing charging stations all over the planet, might as well spend the money on something like this."